Old Town Alexandria is a historic town in Northern Virginia just across the Potomac River from downtown Washington, DC. 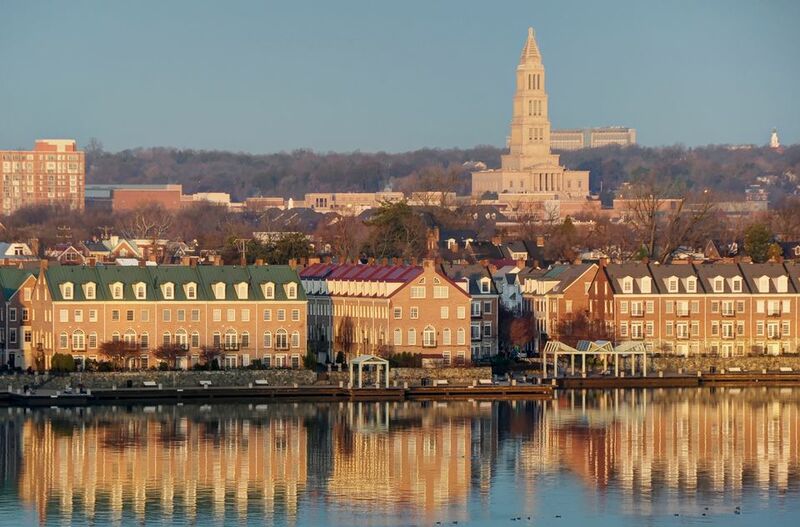 Enjoy these photos of the historic Alexandria waterfront with cobblestone streets, colonial houses and churches, museums, shops and restaurants. See also images of special events that occur throughout the year. Located within minutes of Washington, DC, Alexandria is a picturesque seaport with Colonial ambiance and European flair. The George Washington Masonic National Memorial located in Alexandria, Virginia, houses an outstanding collection of Washington memorabilia. The 333 ft. tall structure serves as a memorial to George Washington and a reminder of his Masonic fraternity on faith in the principles of civil and religious liberty. The George Washington Masonic National Memorial is Alexandria, Virginia's memorial to our first president. The centerpiece of the Memorial is a 17-foot bronze statue of George Washington. Mount Vernon, the former home of George Washington, now serves as a museum devoted to the United States first president. The estate and gardens is located along the Potomac River just outside of Washington, DC. It is one of the most popular attractions in Northern Virginia. The history of Alexandria is recalled each February during the annual George Washingtons Birthday Parade. The Torpedo Factory Arts Center is a historic factory that today houses dozens of artist studios ant the Alexandria Art League. The bustle of activity starts early Saturday mornings as shoppers come out for the weekly farmers market in front of the historic Alexandria City Hall. Gadsby's Tavern Museum and Restaurant is where George Washington used to celebrate special occasions; today, visitors can still celebrate at the historic tavern in Old Town Alexandria. Carlyle House is the most elegant historic site in Old Town Alexandria with a beautifully restored interior and lovely gardens. Parades and festivals fill the streets of Old Town Alexandria throughout the year; this is the Scottish Christmas Walk that takes place in early December. Alexandria is rich in Civil War history with reenactments taking place at the Fort Ward Museum in Old Town Alexandria. The Birchmere Music Hall is a popular live entertainment venue located in Alexandria, Virginia. Quiet cobblestone streets are lined with 18th- and 19th-century buildings throughout the Old Town district of Alexandria. Alexandria has always beckoned shoppers with small, unique boutiques as well as art galleries and antique shops. The Lee-Fendall House, the home of several generations of Lees, is open to the public and includes a display of Lee family documents, among which is the original copy of Harry Lee’s eulogy of George Washington. The gracious homes and well-tended gardens of the Old Town district of Alexandria draw visitors back to a quieter time. The Boyhood Home of Robert E. Lee is an historic site in Old Town Alexandria. The Chart House is a seafood restaurant located on the waterfront in Old Town Alexandria. The restaurant offers upscale dining an great views of the Potomac River. In early December, boaters decorate their vessels – large and small – to compete in the annual Parade of Lights in Old Town Alexandria. The Alexandria City Hall in Alexandria, Virginia was built in 1871 and designed by Adolph Cluss. It is also known as Alexandria Market House & City Hall as the space was originally a market in 1749. The building houses many of the Alexandria government offices, including the City Council Chambers on the second floor. The outdoor plaza is often used for public events. Ramsay House Visitor Center is a historic home that is used as the city's visitor center and offers maps, brochures and tourist information. It is located at the corner of King and Fairfax Streets, in the heart of the Old Town Alexandria Historic District. The smallest house, located on Queen Street in Old Town Alexandria, was built in 1830 and is only 7 feet wide. It has two stories but only 325 square feet.